AMD reportedly cancelled its Carrizo-based FM2+ APUs and will fill this gap on its roadmap by introducing a refresh of Kaveri with faster clockspeeds. VR World published a leaked specification sheet of these chips, which are codenamed Godavari. The flagship A10-8850K will have about 19% boost in GPU clock speed. Maximum GPU speed increase for A8 parts is more modest, only 5.5%. 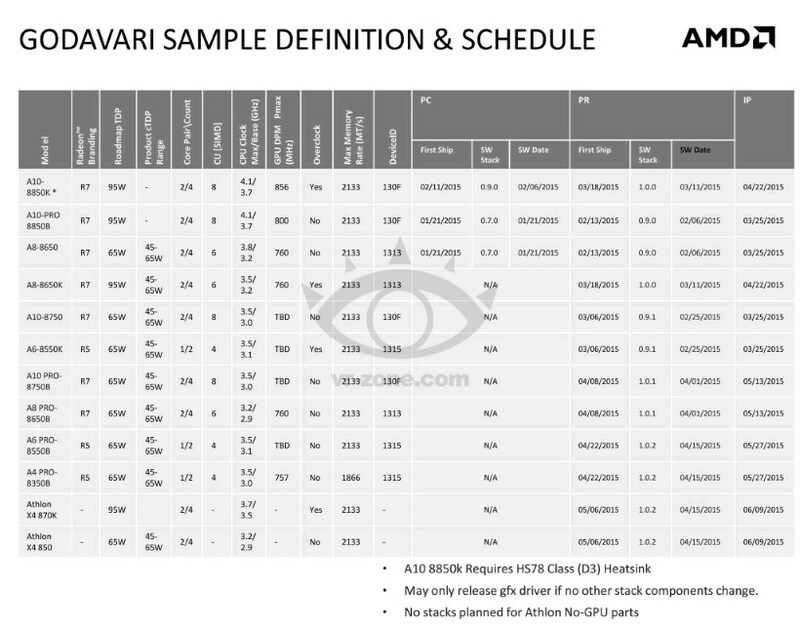 Known specifications of all Kaveri Refresh processors are provided below. Please note that CPU and GPU frequencies may still change before the official launch, which should happen in the first half of 2015.